Nutritionists agree that the best way to lose weight and keep it off is to modify your eating habits in such a way that you are taking in lesser calories and still don’t feel deprived. Making small changes to your diet every day will help offset weight gain over the year, and possibly even help you to lose weight. 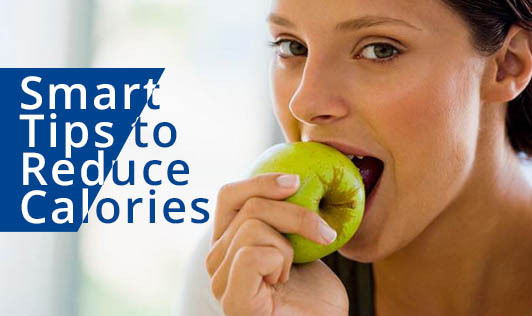 The more tips you implement, the more calories you cut from your diet! Here are some healthy ideas to help you reduce your calories in your meals without compromising on taste or nutritive value. 1. Go for whole grain: Acquire a taste for whole grains and improve your over all diet and health. 2. Opt for fresh fruits instead of juice: Fruits contain fewer calories and more fiber. 3. Go fresh with veggies: Salads and steamed or sautéed vegetables give you more nutrients than fried vegetables. 4. Choose smaller plates: They reduce your calorie intake without you being aware of it. 5. Drink water: It goes without saying that water has no calories. 6. Reduce portions: You don’t have to give up on your favorite food, if you like munching on them. A small quantity and reduced frequency of your favorite food is alright. 7. Cut down on the sugar, oil, ghee which you use for cooking and try to use a non stick cookware that will consume less oil for its preparation. 8. Select lean proteins: Lean protein of chicken, fish contain less calories and quality protein. 9. Pay attention while eating out: When you are out to enjoy food, go for intelligent combinations. Balance one high calorie dish with a salad or soup. 10. Get enough sleep: A study says lack of shut-eye can make you snack. 11. Tap your foot: Walk around while you’re on the phone to burn more calories. 12. Read the labels on the products you want to buy at the store. Choose foods that have the right nutritional value. 13. Do not forget exercise: Physical activity leads to immediate calorie expenditure during a particular workout, and also helps us to continue burning extra calories even when our fitness routine is over.